Buy a Nokia phone - specially the ones like Nokia 5800 or Nokia X6 or any other which are labelled "comes with music" or "music unlimited"
Validate your music coupon and download a few songs from using Ovi Player. This is completely legal. 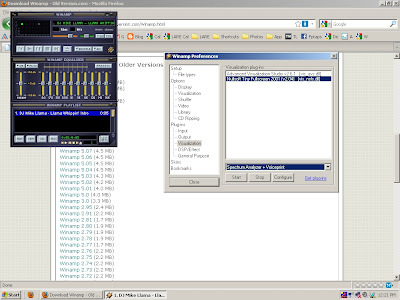 Install Winamp 2.95 (older version). You can get it from oldversion.com here. Load the song in winamp, play it and press "Ctrl+Shift+K" to watch the live spectrogram of the song. The Spectrogram is updated from left to right. Press "Esc" key to get out of fullscreen mode. If you want to see the voiceprint of your voice, "add a URL" to playlist and type "linein://" into the textbox asking for location. After this is done, double click on the entry in the playlist which says "Line in" and set the recording control to Microphone, switch back to winamp, press "Ctrl+Shift"K" and speak or whistle into the Microphone to view the spectrogram. Instead of the microphone, you can set the recording control to "Line in" and apply any signal to your sound card's "Line in" and observe its spectrogram. If you are worried about frying your computer's sound chip, try this. Spectrogram of a song. The instantaneous spectrom is displayed using the bars at the bottom of the screen. This spectrum is translated to pixels of varying colours depending on the amplitude at the frequency and displayed as a vertical line in the voiceprint (or spectrogram). Within the spectrogram, the frequency increases vertically from bottom to top. Setting the recording control to microphone for "linein://"